This vertical-format panel entered the collection from the Italian artmarket prior to 1930. The earliest related documentation are two reports written by Raymond van Marle and Wilhelm Suida in which these authors comment on the quality and attribution of the panel. Van Marle considered it to be by Baronzio da Rimini and published it as such in the Munich exhibition in 1930. Suida, however, considered it to be by the Master of the Triumph of Death. The same year as the Munich exhibition, in 1930, Evelyn Sandberg-Vavalà published an article in Rivista d’Arte attributing it to Vitale da Bologna, an attribution that has been accepted since that date. 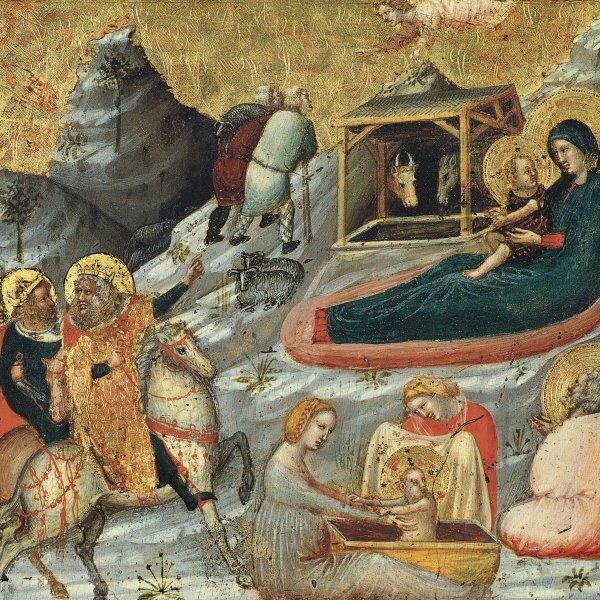 Vitale da Bologna is considered the most important Bolognese painter of the first half of the 14th century. His first documented work, of 1330 (now lost) was the decoration of the one of the chapels in the church of San Francesco in Bologna. 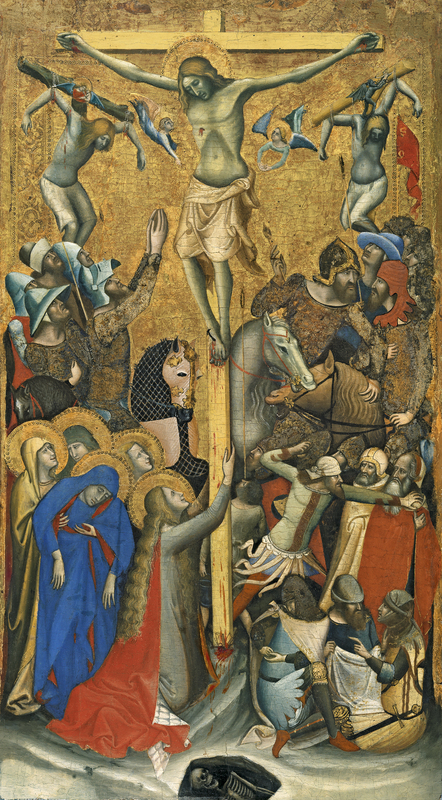 One of his most important paintings, the Maddonna dei Denti, is dated 1345 and was executed for the church of Sant’Apollonia in Mezzaratta, where the artist also worked on the interior decoration, considered one of his greatest achievements. According to Boskovits, the present panel should be dated between those two works. While the attribution of this painting has been accepted without hesitation, its date has been the subject of debate. Longhi suggested a date after 1353 due to various decorative elements which he considered to be Venetian in type and which the artist would thus have assimilated during his time in Udine. For Longhi, the frescoes in the cathedral in Udine have also provided a solid reference point for a dating for this panel of between 1345 and 1350. Gnudi, however, considered it a masterpiece from the artist’s last period and the prototype for the painting of the same subject in the Philadelphia Museum of Art. The artist places considerable emphasis on the vertical format and long, narrow shape of the composition, emphasised by the position of the Christ, the placement of the two thieves and the arrangement of the two groups around the Saviour. Despite the use of a gold background the artist attempted to create a sense of space, proportion and coherence between the different parts of the composition, although on occasion he deliberately interrupted the rhythm, for example, with the insertion of the group of Jews on a smaller scale between the riders on the right. The composition is complex and crowded, opening up on the left with the two holy women supporting the Virgin, who has fainted, next to Saint John and the kneeling Magdalen who embraces the cross. On the right the artist included some of the most anecdotal elements from the Gospel accounts, such as the three soldiers playing dice for Christ’s clothes. Behind them a forceful, dynamic scene involves a figure holding back a group of men whose clothes indicate that they are Jews. Among the closely packed riders in the background we can distinguish Longinus on the left, raising his arms and joining his hands in prayer. On the opposite side the bearded figure turning round to talk to the man beside him is probably the centurion of the biblical account. In addition to the unusual group of the Jews, another innovative element is the way of arranging the two thieves. Both hang from crosses that have no upper vertical arm. They are tied to them with ropes around their elbows and shoulders, making their bodies fall down heavily. In order to identify them clearly, the artist painted a small demon carrying off the Bad Thief ’s soul and an angel engaged in the same activity behind the Good Thief on our left. Adam’s remains, a common element included in Crucifixion scenes, are depicted here in the form of the skeleton in the pit at the foot of the cross. The colour range is particularly striking: strong blues and reds alternating with a delicate range of grey-blue tones, judiciously arranged across the surface of the composition.